SIMCJOH is lead by Genoa University and provides an HLA interoperable immersive framework for the Commander and his staff within critical decision making over Joint and MultiCoalitions scenarios, considering a strong impact of human factors. 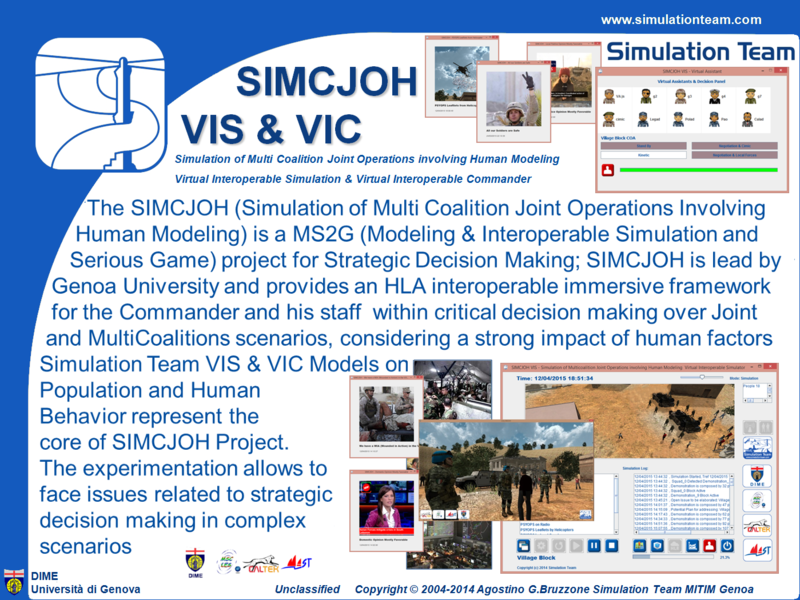 Simulation Team VIS & VIC Models of Population and Human Behavior Modeling are the Core of SIMCJOH Project. The experimentation faces issues related to strategic decision making over complex scenarios. The SIMCJOH VIS & VIC (Virtual Interoperable Simulation & Virtual Interoperable Commander) have been created by Simulation Team ( DIME, MSC-LES, Cal-Tek and MAST, ) and successfully tested integrated in SIMCJOH Federation with Simulation Team IA-CGF. SIMCJOH Federations includes also Selex ES SGA, CAE GESI.